While searching for photos of the boys with flags, I came across this. 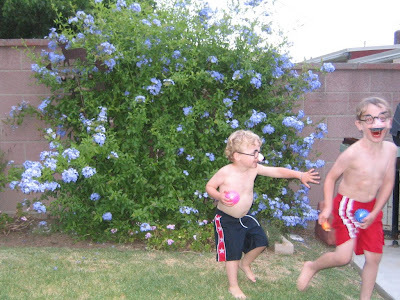 What strange kind of game could they have been playing back in 2006 in a friend's backyard that would have required swimsuits, rubber bouncy balls, and Groucho Glasses? That was at my parents house, huh? Technically it was still your house! That was when you invited us over and made us taco salad and Michael took apart your dad's special puzzle thing... Good times! I put this up just for you!